MONTREAL, QC, CANADA, February 21, 2019 /EINPresswire.com/ -- L3 Technologies is pleased to introduce Orchid® Immersive Experience (Orchid IX), the latest in display technology for accurate 3D immersion without the use of VR headsets. 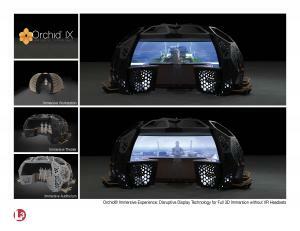 Orchid IX makes 3D content come alive at a near-retinal resolution in a collaborative and interactive environment. With Orchid IX, project teams will be able to simplify the design and review Building Information Modeling (BIM) workflows to increase productivity, minimize project risks and improve project outcomes. Additionally, Orchid IX enables virtual visits of high-value new build projects to facilitate finalization of designs. The technology supports realistic asset visualizations for planning and training on ships, submarines and power plants, including refurbishment, radiation worker training and decommissioning. Orchid IX is available in three formats – the single-user Immersive Workstation, the three-user Immersive Theater and the six-to-ten person Immersive Auditorium. The product is available for shipbuilders, architects, planners, engineers, project managers and operators of naval vessels, commercial marine vessels, power plants, and innovation and training centers, as well as other interested marine and power industry stakeholders. To make an appointment to experience Orchid IX firsthand, contact immersive.experience@L3T.com. L3 Communications & Networked Systems is composed of three diverse business sectors: Broadband Communications, Integrated Maritime Systems, and Communications & Microwave Products. The business provides world-class expertise in connecting space, airborne, ground and sea-based platforms with secure, real-time data. We are an industry leader in developing and fielding advanced solutions for military, commercial and research customers. To learn more, please visit www.L3T.com/business-segments/communications-networked-systems. Maritime International (MINTL) is a newly formed division within the Integrated Maritime Systems sector consisting of the former global L3 MAPPS locations, L3 Communication Systems-Canada and L3 Calzoni businesses. Orchid is a trademark of L3 Technologies. All other brand names and product names referenced are trademarks, registered trademarks, or trade names of their respective holders.